As the days grow colder and shorter, sometimes there is nothing quite so amazing as a steaming bowl of soup. Soup is wonderful for so many reasons. 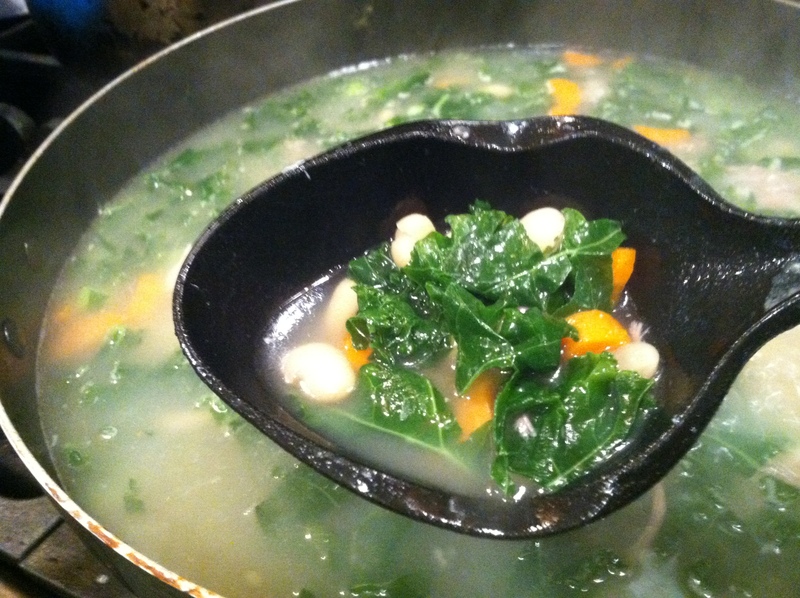 You can easily sneak all kinds of healthy veggies and ingredients into soup. Soups are generally very kind to the budget, with frugal ingredients like beans and grains, and the ability to save about-to-expire produce. 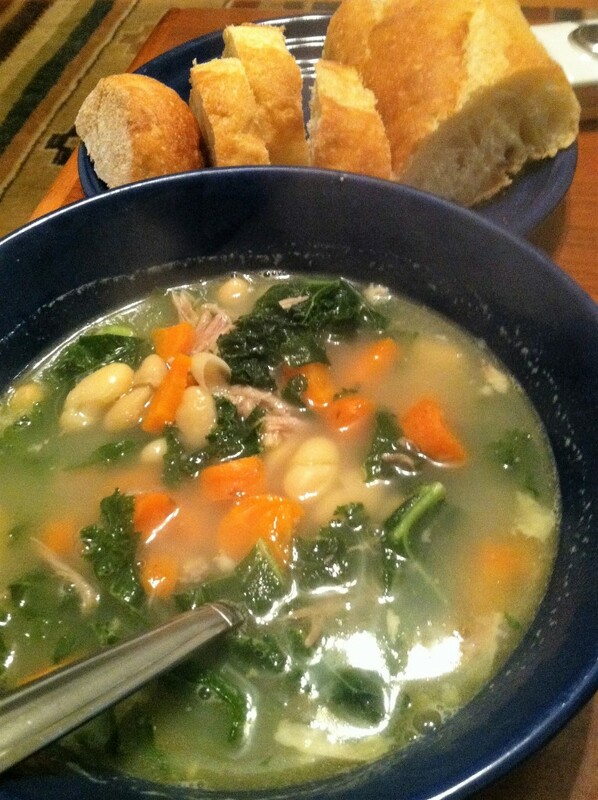 Soup feels good on a sore throat, and is mostly healthy (if broth based, not fatty/creamy). And soup just tastes great. 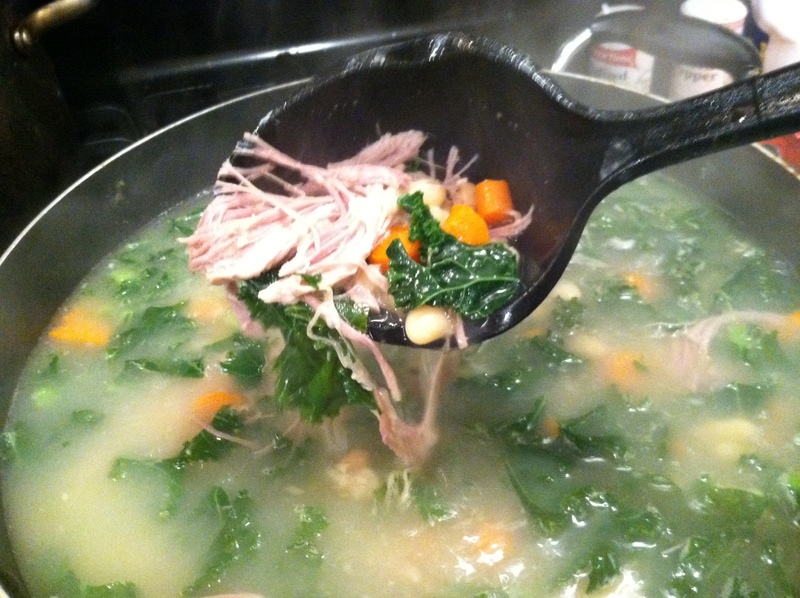 This ham soup starts with a rich & nutritious broth made from the ham bones, but if you don’t have the time (or the bones) you can use pre-made stock as well. You can also substitute in any type of veggie you prefer, though I recommend sticking to about 2 cups of some sort of leafy green, and 1 cup of another harder veg for contrast. Step 1: In a crock pot or stock pot, simmer the ham bone in enough water to cover for 8-12 hours, during the day or overnight. 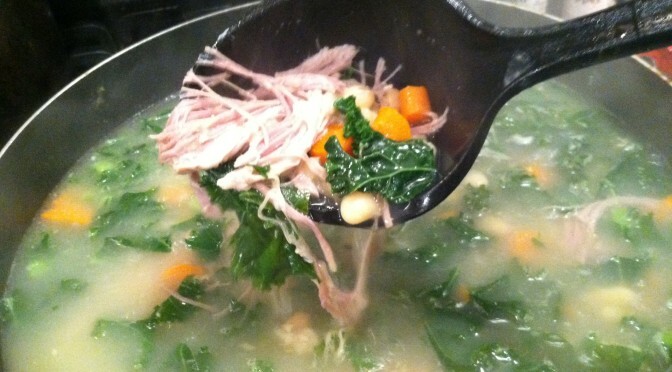 Strain the liquid, pull any remaining meat off the bone and shred it, and return it to the pot. Discard the bones. 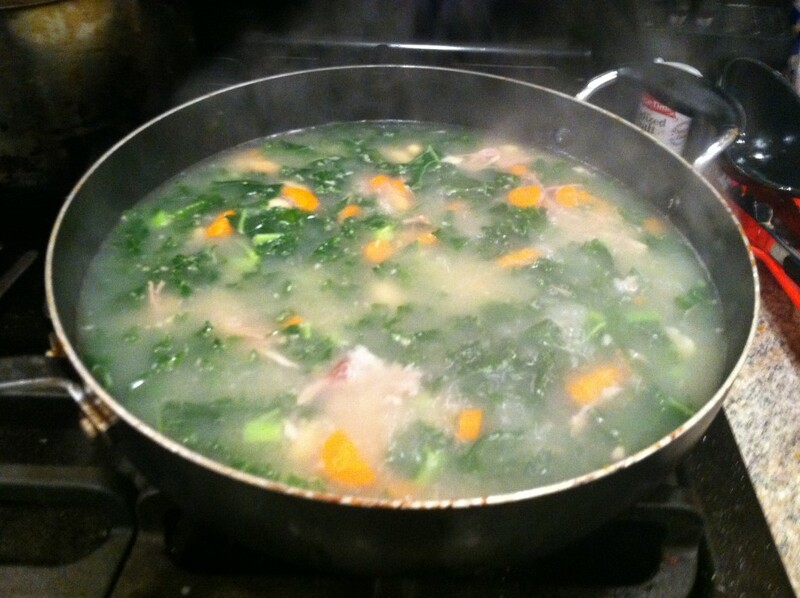 Step 2: Bring the stock to a boil, and add the kale and carrots. Drain and rinse the beans to get rid of excess sodium and add to the pot. Simmer for 15-20 minutes, until carrots soften. Step 3: If needed, add in the bouillon. This soup seems simple, but the base is so flavorful from being stewed so long. I suggest serving this with thick, soft Italian or multi-grain bread, and you may or may not want to shred some cheese over top. I added just a touch of Vermont white cheddar, and it was absolutely scrumptious! 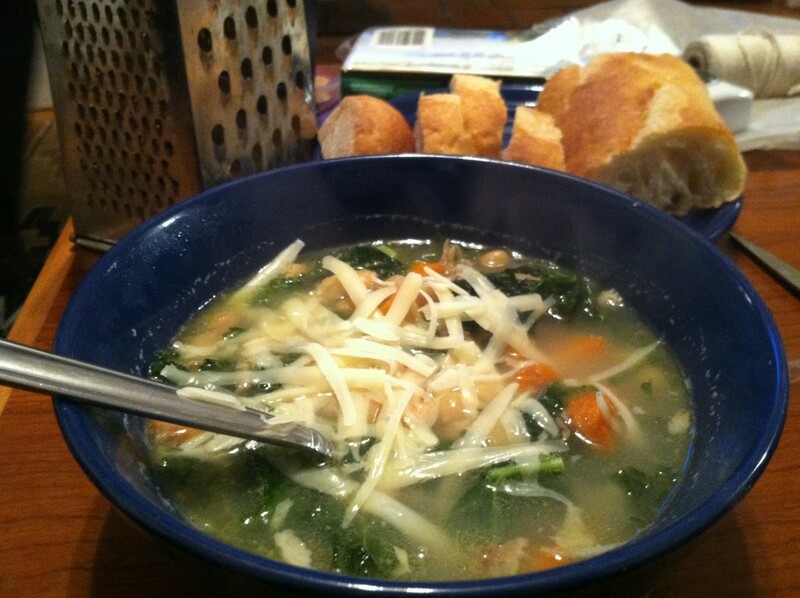 Even the fiancee, who just kind of tolerates soups, loved it and had seconds. If you’d like your soup a little thicker, add less water and mash up one of the cans of beans before adding it.